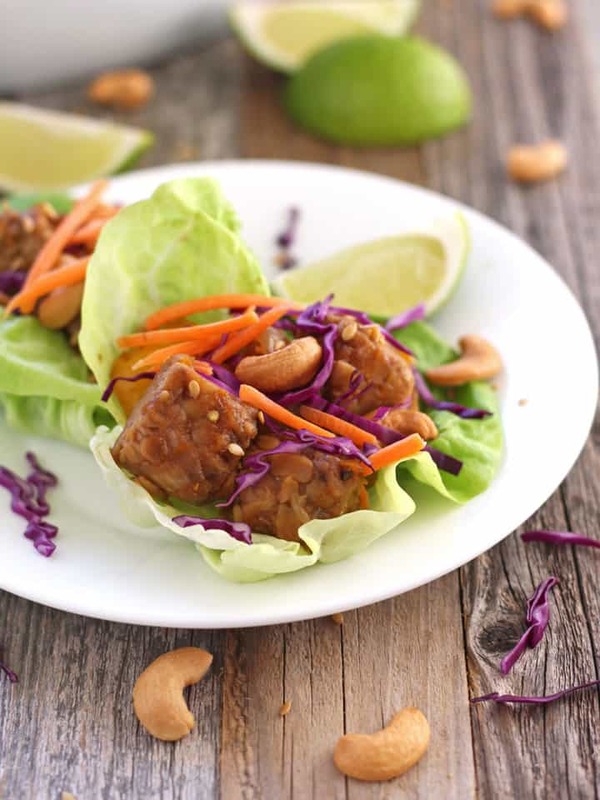 Loaded with protein, these sweet and spicy Sriracha Tempeh Lettuce Wraps taste like guilty pleasure take-out but are made with better-for-you ingredients! Spend a few minutes prepping everything before work, then quickly toss the marinaded tempeh and veggies in your toaster oven when you get home and enjoy an easy vegan dinner for two. This is the first question I’m always asked after mentioning I don’t eat meat. Answering is super fun because I really ♥ talking tempeh! Then I get a little quieter. Softer. Like I’m about to share with them the secret to the most delicious high protein meat-free meal (because I am). They lean in closer…Wait what did you say? Say it again? What is that? Tempeh isn’t a secret, though it kind of feels that way. It’s just that this protein-powerhouse gets so little attention. If you aren’t following a meat-free diet chances are you may have never seen or heard of it. A few years ago I had no clue tempeh existed. Short Answer: Tempeh is a flat cake of fermented cooked soybeans usually mixed with grains. It can be found near the tofu at natural food stores and some major grocery chains. It can be pretty wild looking too and sometimes has brown, black and gray spots on it from the natural culturing process (like cheese). I’ll save you the history lesson but if you want to learn more about the origin, production and preparation of tempeh Wikipedia has you covered and then some! 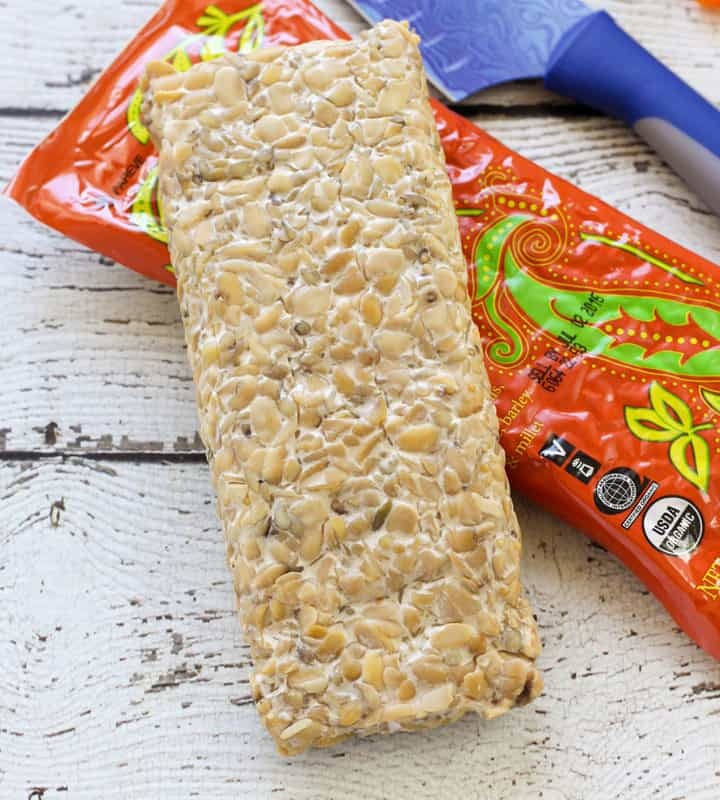 Straight out of the package tempeh tastes quite unique with a mix of nutty flavor and earthy mushroominess. Some people find it slightly bitter or sour which makes sense when you remember that it has been fermented. Even though tempeh is fully cooked and can be consumed “raw” it’s usually prepared with a marinade or sauce to eliminate any bitter flavor. a whopping 20 grams of Protein! Different from the eggy-ness of tofu, tempeh has a much firmer toothy texture. This makes it a terrific addition to stir fry, crumbled into spaghetti sauce or fried for tacos like this recipe for Crispy Tempeh Tacos from Macheesmo. 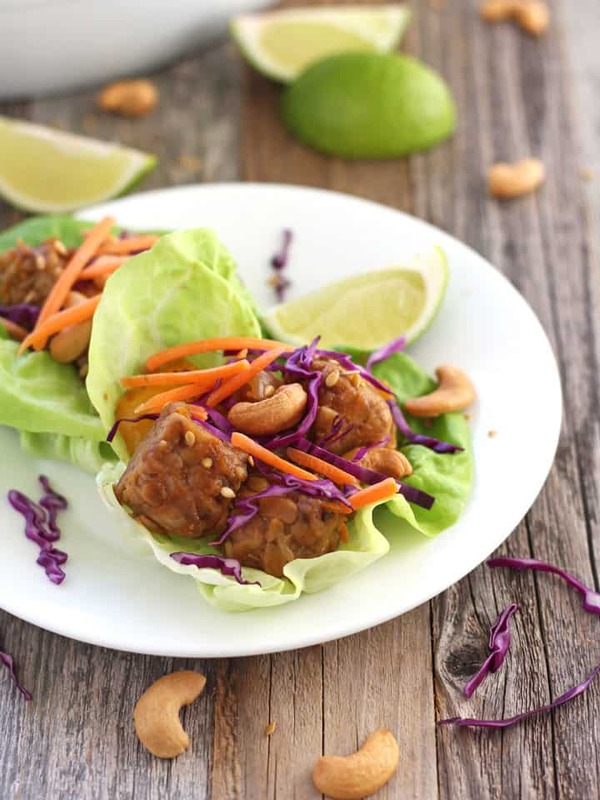 But my favorite way to prepare tempeh is in these super tasty Sriracha Tempeh Lettuce Wraps. They’re spicy, tangy, sweet and crunchy. Like guilty pleasure take-out but using way better ingredients! Mix together Sriracha sauce, sesame oil, salty liquid aminos (or soy sauce), tangy rice vinegar, garlic, ginger, and fresh orange zest to form the marinade. You can marinate the tempeh, peppers and onions for a quick 30 minutes or make the marinade before work and let the flavors soak in all day. Once you’re ready to cook the tempeh, pour the contents into a toaster oven-safe baking dish and bake until most of the liquid has been absorbed. While your tempeh bakes, grab a head of lettuce and pull off some leaves. I like to double up the lettuce leaves to provide added structure for the wraps. Spoon the cooked tempeh filling onto the leaves and top with crispy red cabbage, shredded carrots, buttery cashews and a sprinkle of toasted sesame seeds. Lastly, a squeeze of fresh lime juice is the finishing touch on this meat-free dinner that’s bursting with bright flavors and textures! 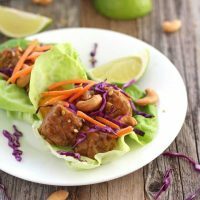 Loaded with protein, these crispy crunchy lettuce wraps taste like guilty pleasure take-out food but are made with way better-for-you ingredients! Place tempeh, bell pepper and onion in a large resealable plastic bag. In a small bowl whisk together the liquid aminos, vinegar, maple syrup, sriracha, sesame oil, garlic, orange and ginger. Pour mixture over the tempeh, peppers and onions. Squeeze most of the air out of the bag and seal, then toss gently to coat. Place in the fridge and marinate at least 30 minutes, flipping once after 15 minutes. After marinating, preheat toaster oven to 450 F.
Pour bag contents into an 8 x 8-inch toaster oven safe baking dish and bake for 30-35 minutes stirring halfway through. The dish will be ready when the peppers and onions are tender and most of the liquid has been absorbed. Allow dish to cool for 5-10 minutes, the tempeh will absorb any remaining sauce as it cools. Layer two lettuce leaves together and spoon 1/6th of the filling onto the leaves. 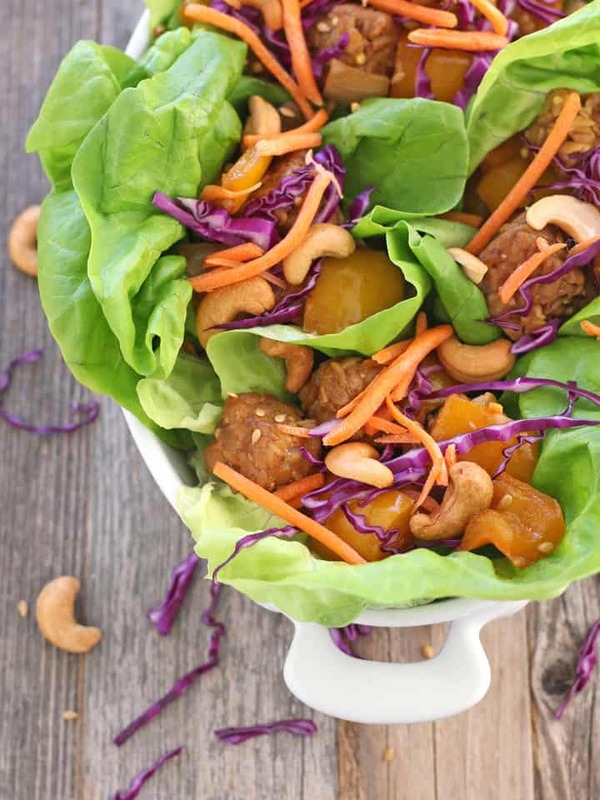 Sprinkle with a little carrots, cabbage, cashews and sesame seeds. Repeat with remaining ingredients and serve with lime wedges. Prep Time includes 30 minutes of inactive time marinating the tempeh. Tempeh can be found near the tofu at natural food stores and some major grocery chains. We use Bragg Liquid Aminos which can usually be found near the vinegar at most grocery stores. You can also substitute your favorite soy sauce instead of using liquid aminos. Rice Vinegar and Toasted Sesame Oil can be found at any Asian grocery store or in the Asian foods section at most major grocery stores. 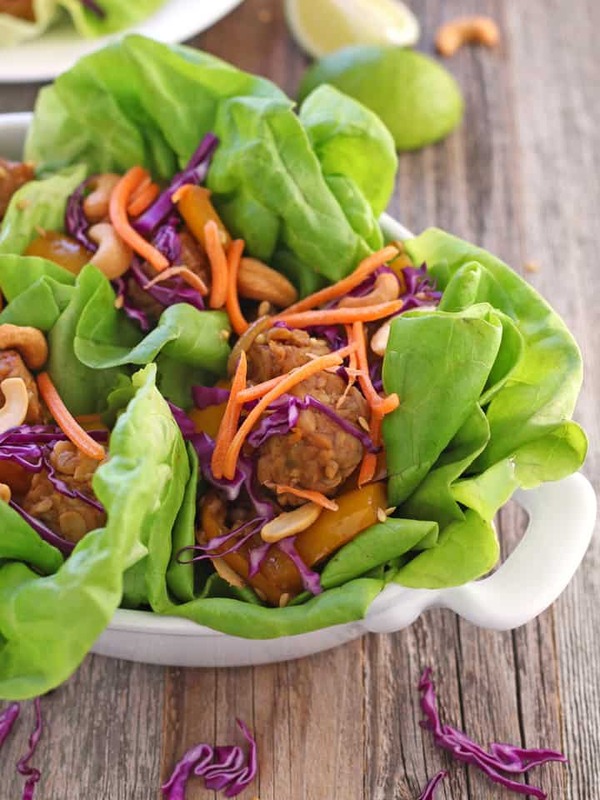 Recipe makes 6 lettuce wraps, Nutritional Information is an estimate for a single serving of 3 lettuce wraps. We use Bragg Liquid Aminos because we like the flavor and it is less processed. 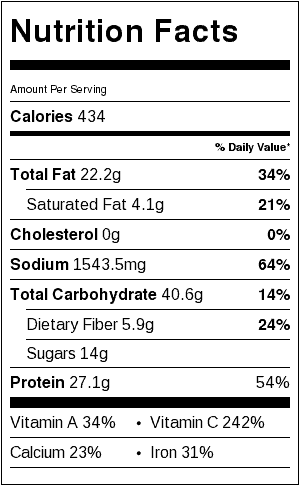 Although it has less sodium than your regular soy sauce it is not a low-sodium food. If sodium is a concern for you, a quick glance at the nutritional information might have you saying “Holy Sodium Batman!” In this case substitute 3 tablespoons of your favorite low-sodium soy sauce for the liquid aminos. Another low-sodium option is Coconut Aminos. It can be found on Amazon, at heath food stores and some major grocery chains (Tim got our bottle at Sprouts Farmers Market). We tried this recipe using the Coco Aminos from Big Tree Farms which has 160mg per teaspoon. When substituted equally for the liquid aminos it reduced the sodium to 399mg per serving. The final dish was missing that earthy salty quality and instead tasted more like a spicy-sweet orange chicken flavored dish. Not bad – just different and much sweeter (even after eliminating the maple syrup).